€1,170 raised for Sherrard House, for homeless Teens. Thanks to all for their support and enthusiasm. The first year A team beat st Dominic’s, Cabra by 4 points. The second year A team beat st Mary’s, Glasnevin by the same margin. The first year captain is Grace Cleary and the second year one is Roisin Boland. Congratulations to Class 4L on winning ‘Best Artistic Performance’ at the YSI Speak Out on March 4th in the Mansion House. Their project involves lobbying the government for free sanitary products for girls in schools and colleges. They wrote a poem and performed powerfully on the day. We all had a great day. A special thanks is due to all who supported this event- parents, members of staff, students inparticular Nina Coghlan Colley who gave valuable advice from her experience last year and to our loyal first year substitute Emma Venables. Maryfield College are working on becoming a European Parliament Ambassador School and have been learning more about the European Union. Here are some of the Junior Ambassadors pictured with Lauren Carroll from the European Parliament when she visited Maryfield yesterday to discuss our activity and the work we’ve been doing so far to raise awareness about the work of the EU and to celebrate the diversity of Europe. Congratulations to the u16 camogie team who were crowned Dublin champions! They beat St Macdara’s by 21 points and will now represent Dublin at All Ireland level. On Friday 18th January 2019, the 3rd annual Intercultural Day was held in Maryfield College. The day saw Maryfield hall exploding with colour, sounds, tastes and culture from all over the world. In total there were, 16 countries exhibiting and Maryfield students represented their cultures confidentially and passionately. The day is a wonderful opportunity for students with diverse cultural heritage to present their culture to the other students in the school and it is a great chance for us as a school community to learn more about other cultures in the world and perhaps more importantly, the diversity of the other cultures we have here in Maryfield. The day was organized by Ms. Mellon and The Global Issues Group and supported by Worldwise Global Schools and Irish Aid. 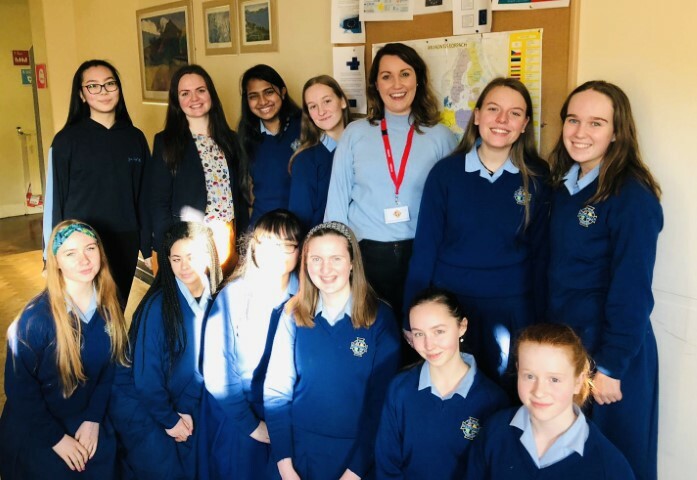 We were delighted to have Lauren Wright from Concern Worldwide present on the day to encourage the students to engage with the UN Sustainable Development Goals and learn more about how their actions impact the wider world. The Global Issues Group see this day as a really important part of celebrating diversity in Maryfield and reminding us that all over the world, we are united by our common humanity. We hope that days such as these might remind us to continue to look out for our brothers and sisters all over the world and to always endeavour to live responsibly and sustainably so that we can ensure a fairer more just world in the future.